I'm Amanda...mom, Latter-day Saint, designer. Working on creating myself and shining my light. Here are links to our friends who are making this block! We are so excited to have them join us and to share their FUN blocks!! Click on their names to link to their blogs. Our first block represents the quality of fun! Fun is so important in a friendship. In many ways fun is what forms a friendship in the first place. Often two people come together because of a shared passion, activity, or experience. As quilters much of our fun happens in pursuit of our shared passion. We delight in thread, we revel in fabric and we get adventurous with projects. A sale at our local store stirs up emotions and behaviors reflecting that of a kid in a candy shop. With so much fun at our fingertips it’s nearly impossible not to share in the fun together. How many times have we created friendships at some shared activity where we were creating new? How often have we bonded over our love for fabric or notions? How many life long friends have come into our lives because we were willing to step out of our homes and connect with one another because of our love for sewing? Even those times when we are frustrated over learning a new technique we find that fun slips in and most of the time we gain a new friend, renew and replenish an old friendship or have something new we are eager to share with our steadfast buddies. Peter Gray, a research professor at Boston College, writes that much play “is self-chosen and self-directed,” an imaginative, non-literal activity “in which means are more valued than ends,” with “rules that are not dictated by physical necessity but emanate from the minds of the players.” So remember, when playing don't beat yourself up to much if your measurements don't come out right the first or second time. Don't get worked up over having to unpick a little here or there. It's all part of the process and the process is fun... most of the time... or we wouldn't keep going back! So play with your fabric, play with your friends and family. Have fun experimenting with your projects and invite a friend or two along. And remember, with each project you create, you are feeding your body and mind but you are also creating something that will beautify, comfort or bring happiness to yourself and others. Lady Allen of Hurtwood said, “Better a broken bone than a broken spirit”. I would amend that to, “Better a broken needle than a broken spirit”! 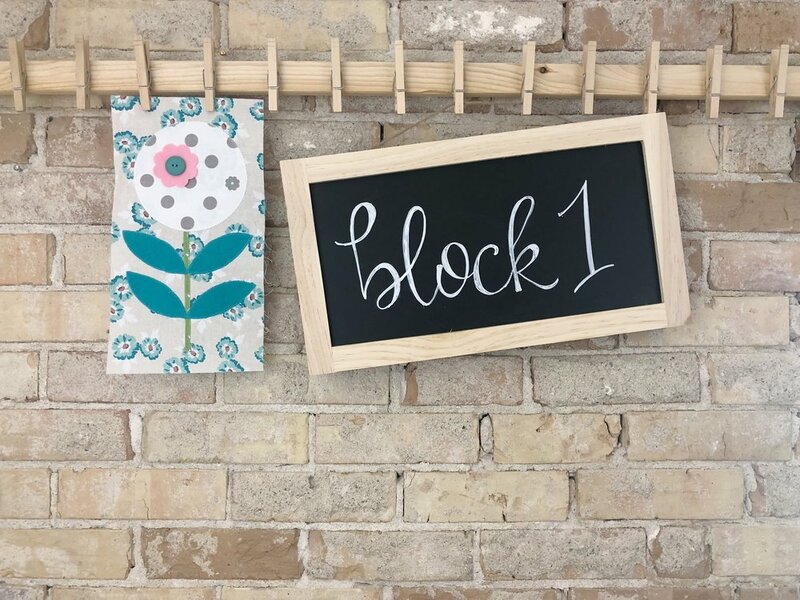 For this block there are so many techniques you can use! We used two different techniques on two different blocks for this one. Prepared hand appliqué and shadow appliqué using a double sided fusible product. For the prepared hand appliqué, we traced the templates onto wax paper, and cut out two of each shape for each piece. Then we ironed it to the back of the fabric and pressed the fabric to the back side using starch and a hot iron. For the circles, we gathered the edge with a basting stitch and pulled it tight around the wax paper. Then we ironed it using starch and a hot iron. For the tiny flower, we made it easy and used wool. This shape can be difficult to manage and I like to make things easy! We stitched it in place using a blanket stitch and Aurifloss. There are also lots of techniques for the stem, but we opted for using a bias tape maker! The size we used was 1/4", and it makes it so slick and easy. Just tuck your ends under and hand stitch around the stem. Once all the pieces are cooled, we popped out wax paper templates, laid our pieces in place and hand stitched them using our favorite Aurifil thread. For the shadow appliqué method, trace your template onto the paper side of the double sided fusible product. Cut out on both sides, leaving about 1/8" of fusible on each side of the line. Fuse to the back of your fabric. Cut out ON the line. Peel the paper off and you are ready to fuse to the background fabric. Repeat for all pieces you are using this technique on. Lay everything out on the background fabric and fuse in place. Sew in place using your favorite stitch (we love to use the blanket stitch!) or stitches. We also mixed in some wool on this block, too. I love mixing textures and substrates. I think it makes things really interesting! Here is a video of this technique that Fat Quarter Shop filmed: COMING SOON! !